While planning an upcoming trip to San Francisco, I felt inspired to watch a film that beautifully captures the scenery, the history, and the mystery of this city. 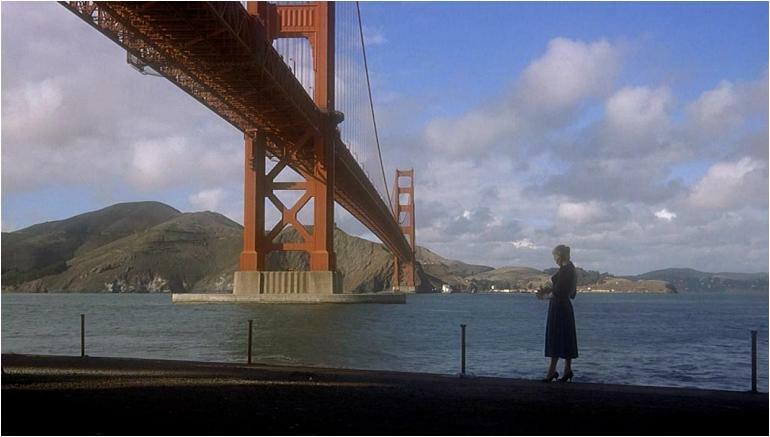 I settled on the Alfred Hitchcock classic Vertigo, which is sometimes remembered more for Jimmy Stewart’s odd Technicolor acid trip dream sequence, but in my mind will always be remembered for a beautiful Kim Novak throwing herself into the San Francisco Bay as the Golden Gate Bridge frames the scene. It’s a dark, confusing tale that manages to make even sunny California seem downright sinister. Furthermore, it’s the rare movie where Jimmy Stewart is a bit of a creep, hobbled by his fear of heights and a strange attachment to a lost love. He’s not exactly a villain, but making your new girlfriend dye her hair and dress up like your old dead girlfriend is definitely on the disturbing side. In Vertigo (DVD/Download), Jimmy Stewart plays retired police detective Scottie Ferguson, who is hired by an old college friend to investigate the friend’s wife, played by Kim Novak (long before Botox and surgery froze her face- see 2014 Academy Awards). She is suspected of either being insane, or of actually being inhabited by the soul of a long-dead woman named Carlotta Valdes. Of course Scottie falls for her, shortly before she appears to throw herself out of the bell tower of an old California mission. The plot is initially a bit confusing, but Hitchcock manages to brilliantly weave everything together so that in the end it all makes perfect sense. Jimmy Stewart turns in a performance that’s intense and manic (I’d go so far as to call him the Nicholas Cage of the 50’s in this), and the Edith Head costumes for Kim Novak are so wonderful that I would gladly trade places with her for a day (though only as Madeleine Elster and not cheap, tawdry Judy). My cocktail pairing for Vertigo is a San Francisco classic. Many believe that this drink was first served in the United States at San Francisco’s famed Buena Vista Café, the recipe having been brought over from Ireland by travel writer Stanton Delaplane. I’ll certainly be stopping at the Buena Vista to sample the real thing, but in the meantime, while watching Vertigo, I recommend making an Irish Coffee. Pour piping hot coffee into a warmed glass mug until it is about ¾ full. Add the brown sugar and stir until dissolved. Blend in Irish Whiskey. Top with the whipped heavy cream by pouring gently over the back of a spoon. Serve hot. This drink will warm you up as Hitchcockian suspense sends shivers up and down your spine, and images of foggy evenings and the woman in the grey wool suit make you colder just watching them. I’m sure Kim Novak and Jimmy Stewart could have definitely used a couple of Irish Coffees after their dip in the San Francisco Bay. Watching this film reminds me what a master filmmaker Hitchcock was, and it makes me even more excited to visit the city where ghosts and intrigue mingle with fog and warm whiskey. Cheers! Posted in Classic Films and tagged Alfred Hitchcock, Buena Vista cafe, Irish Coffee recipe, Jimmy Stewart, Kim Novak, San Francisco, Vertigo. Bookmark the permalink. Great blog. I enjoyed an Irish coffee at the BVC a few years ago. It is quite the place, filled with memories. Thanks adventuresinlowvision! I’m eager to stop in to the BVC for the real thing!